Join us on Saturday 30 September for a Clean Air Conga. 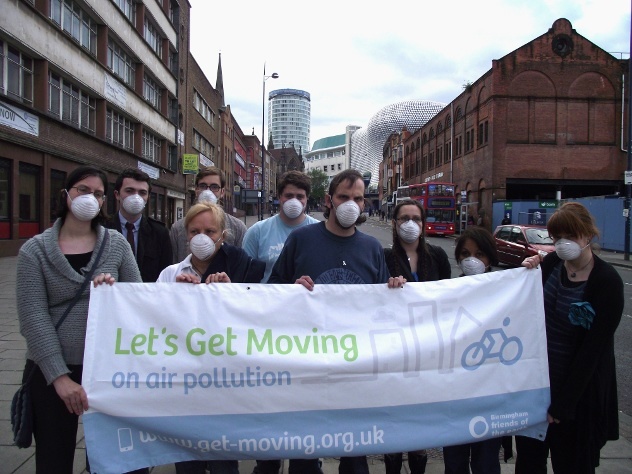 The air quality in Birmingham City Centre is poor which has a negative impact on our health. As part of our breath of fresh air campaign we will be leading a guided walk around the city centre, stopping off at pollution hotspots and the different forms of public transport. The walk is open to everyone and is a great way to find out more about Birmingham’s poor air quality and how you can help make a difference. We will start the walk at The Warehouse on Allison Street up to Moor Street Station past Selfridges Car Park, up to New Street Station past the bike pump, taxi rank and station drop off point. Then we will take a look at the bike hire points and tram network before taking a look at the electric charging points near Birmingham Cathedral. We will then make our way back to The Warehouse for some refreshments. You are more than welcome to bring a picnic along and join us in Digbeth Community Garden for lunch. Our Clean Air Conga will coincide with Sprockets’ Big September bike sale. For those who wish to find out more about our clean air campaign but are unable to come along for the walk, we will be having a campaign stall at Sprockets Sale at The Warehouse.